I came to know that even within the economy class, there are two-three options for the traveller, but I don't know if that translates to bigger area for your seat. I travelled in Qatar Airways Boeing's few months back and both of them had 17" which I guess is the standard. From BOM to Doha,Qatar it was Boeing 777-300ER and from Doha to CPT, South Africa it was the Boeing 797-8 Dreamliner . IF it was an Airbus would the seat width have been be a bit wider or that's standard for Economy class configuration. If memory serves right, it was 3-5-3 in the first configuration and 3-4-3 in the latter long haul flight. So looking to know how different is it in Airbus on Economy class. You aren't going to see a specific difference between Boeing and Airbus for this. Every aircraft can be configured differently depending on the airline's wishes and it has little to do with who makes the plane. The best thing to do for this kind of information is to check a website like seatguru.com. You can find the seat map for the aircraft operating a particular flight and note the pitch (legroom) and width in the top right of the page. Note that airlines often have different configurations of the same model aircraft. For one of your examples, Qatar has three configurations of the 777-300ER: V1, V2, and V3. V1 and V2 are a 3-4-3 layout in economy with 17" width seats, while V3 is a 3-3-3 layout with 18.5" seats. 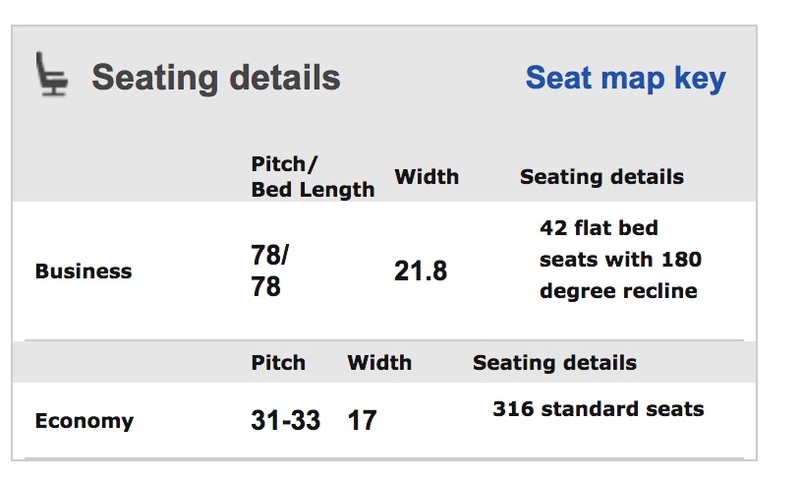 You can often see which configuration the airline expects to use by attempting to match the seat map on the airline website with the map on SeatGuru, but note that the airline does not guarantee this (they, in fact, do not guarantee the type of aircraft at all) and may change to a different aircraft or seating configuration at any time. Are the Seats in the Boeing 787 narrower than in the 737 in KLM Airlines?